Music is the best medicine despite the kind of disease you are suffering from. I completely believe in the above saying cordially from my own experience in life. There is a constraint when it comes to music that it has to be undertaken longitudinally. The faith contributes more to this factoid rather rational thinking. I would like to prescribe the following medicine though I could not legally do that without a doctorate. Whenever I happen to listen to “Vishnu saharanam” or “Baja Govindham” or “Kurai Ondrum illai” tracks on my playlist, my reflex remains the same. Simply Goosebumps! 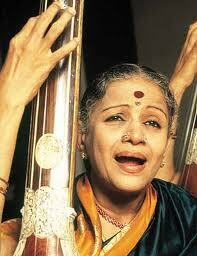 If I describe M.S.Subbhalakshmi as a legend, it would definitely be an understatement to such an extraordinary lady. I cannot ever imagine anyone in par with her vocal chords. Such a matured, thick, stable, candied vox not only imbibes spirituality but also completely waters the soul and inducts the inner peace. I have come cross many anecdotes wherein many humans used to get boons from the supernatural power which I barely believe. But now, I am cornered to conceive this fact whenever I happen to listen to her collection of songs. Her voice has an inherent potent of even converting an atheist to a theist. She has been rightly honoured in getting the privilege of reverberating every morning with her "sahasranaam" chanting at Tirumala, the worldly renowned Hindu temple where Lord Venkateshwara is residing. All her tracks give us a mumsy experience that our own granny is singing to delight us. In no time, all my heavily weighing miseries become light and I end up in enthralling while listening to her tracks. I am not that much interested or crazy about the traditional Carnatic vocals. But, when it is a make of MS, my interest hardly matters.